In any dry bulk material handling operation, dust can be a major problem. Fine particles can create a lot of dust when they are being handled, and since some materials are harmful when ingested, this can be very dangerous to anyone working in the area. Not only can the dust be harmful, but it can create a very dirty environment where cleanliness standards are impossible to maintain. To reduce the negative effects of dust, dust collection units are installed and activated while materials are being handled. 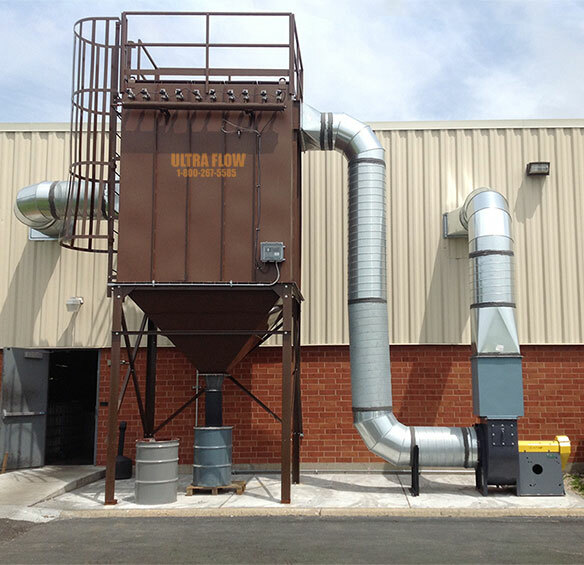 In most pneumatic conveying systems, dust filtration units are integrated into the system at strategic points such as the opening to bins, hoppers, and silos. These filters pull in dust and remove it from the surrounding area, purifying the air during the handling process. From time to time the dust collector needs to be emptied manually or the filter will become clogged because it collects so many loose particles in the air. Dust collectors are often built into bulk bag unloaders, material bins and other types of equipment. Filters in multiple locations of a bulk handling system can be connected through a series of ducts to empty their contents into one central bin. Some of these units must be turned on manually, while others are activated automatically as soon as the handling conveyor is running. Besides the obvious concerns of harm to workers and cloudy air, many industries also run the risk of being the cause of pollution. Some bulk materials can be harmful to the environment if handled incorrectly, so many industries have regulatory boards or bylaws in place to enforce the use of air pollution control systems. Facilities that do not use these systems can be charged and run the risk of doing serious damage to the environment. Dust Collection Dust collectors are often built into bulk bag unloaders, material bins and other types of equipment. Filters in multiple locations of a bulk handling system can be connected through a series of ducts to empty their contents into one central bin. Some of these units must be turned on manually, while others are activated automatically as soon as the handling conveyor is running.